Percentage increase in total costs of care among patients receiving at least one tumor marker test relative to those with no tumor marker tests, by time period after diagnosis. Light gray area indicates the 95% confidence interval around the estimate; both percentages are statistically significant (P < 0.001). Various tests for breast cancer tumor markers are used clinically to ostensibly aid earlier detection of breast cancer recurrence. These tests, however, generally have poor sensitivity and have not been shown to improve survival. Despite clinical guidelines recommending against their use for early-stage cancer survivors, a substantial number of physicians still order these tests. In order to quantify the use and associated costs of these tests, Dr. Scott Ramsey and colleagues in the Public Health Sciences Division evaluated SEER cancer registry records linked to Medicare claims data for tumor marker usage and medical care costs. As recently reported in the Journal of Clinical Oncology, the authors found that 42% of early-stage breast cancer survivors received at least one tumor marker test for surveillance. Those who had these tests had 29% higher total medical care costs compared to those not receiving these tests. Both the American Board of Internal Medicine (ABIM) and the American Society of Clinical Oncology (ASCO) recommend against routine serial monitoring of tumor markers for breast cancer recurrence in early-stage breast cancer patients. These recommendations are based on previous studies showing that use of tumor markers following treatment with curative intent does not improve survival in breast cancer patients. These tests also have poor sensitivity, potentially leading to false positive results that drive downstream costs. "Despite more than a decade of recommendations against their use," said lead author Dr. Ramsey, "we find that more than 40% of Medicare-enrolled breast cancer patients receive these tests." To quantify the costs associated with the use of these tests, the authors analyzed the Surveillance, Epidemiology, and End Results (SEER)-Medicare database from 2001-2007. Focusing on tumor marker tests for carcinoembryonic estrogen and CA 15-3/CA 27.29, the authors analyzed all health care claims for breast cancer survivors within 2 years of diagnosis through billing codes. 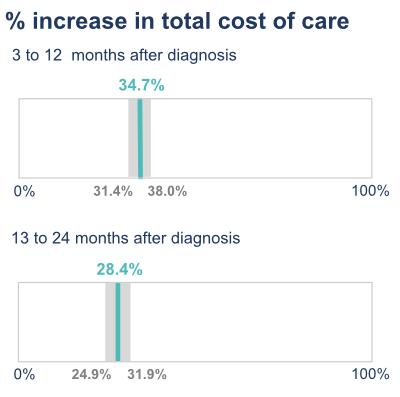 Costs of care were measured as reimbursements for claims filed 3-24 months post-diagnosis. Of the nearly 40,000 eligible breast cancer patients identified during this period, the authors found that 42% had received at least one tumor marker test within two years of diagnosis. The use of these tests had increased over time, from 38% of patients in 2001 to 46% of patients in 2007. Younger women, those with more advanced SEER staging, and women living in rural areas were all more likely to undergo testing. Overall, the total cost of care for those who received at least one test were 29% higher than for those not tested, an average of $6,500 more per patient. The authors additionally found that rates of advanced imaging, but not rates of biopsies, were significantly higher in the group receiving tumor marker tests, suggesting many of these tests reported recurrences that turned out to be false positives. "Our study highlights the fact that substantial savings can be achieved in oncology without harming patients," said Dr. Ramsey. "Given the financial strains that oncology patients and providers are facing today, discontinuing routine use of breast cancer tumor markers in this setting should be a no-brainer. The Hutchinson Institute for Cancer Outcomes Research (HICOR) is committed to help doctors and patients understand the implications of testing, and to help change this practice." Despite these findings, however, holdouts remain. Said co-author Dr. Julie Gralow, "there are still many oncologists ordering these tests, which would likely indicate that they don’t agree with ASCO’s recommendation and that the issue has not been settled with clear evidence." In a companion commentary published in the Journal of the National Cancer Institute, several of the authors call for clinical trials that could definitively settle the issue (see citation). Said Dr. Gralow, "while there is not evidence that shows that earlier detection of breast cancer recurrence improves survival, there are no modern era trials using current treatments and imaging technology." As such, the authors are trying to set up a large study funded to evaluate these questions. "The study would ask a lot of questions about long-term breast cancer survivorshipa WHI-type trial for breast cancer survivors," said Dr. Gralow. If funded, such evidence would help in identifying optimal breast cancer follow-up strategies and bringing clinician beliefs in line with practice guidelines, a win-win for healthcare costs and treatment. Other PHS investigators contributing to this project were Drs. Dana Mirick, William Barlow, Ruth Etzioni, and David Mummy. Henry NL, Hayes DF, Ramsey SD, Hortobagyi GN, Barlow WE, Gralow JR. 2014. Promoting quality and evidence-based care in early-stage breast cancer follow-up. J Natl Cancer Inst. 106(4):dju034. doi: 10.1093/jnci/dju034.